Under the watchful eye of the Angel of the North, St Edmund Campion School has found the answer to the prayers of many who have sought a long-term cost-effective solution to the maintenance problems associated with CLASP structures. Like so many 1960s built structures, St Edmund Campion School, a Roman Catholic school in Wrekenton serving the communities of East Gateshead, features several variations of the CLASP building system. Steel framed and clad in low-grade timber, the single and two storey facades have, for many years, presented an unwelcoming vista for visitors to the 950-pupil school. Now, with the vision of the headmaster and his team, and some innovative work by UK systems company L.B. Plastics, the school has received a new look, and a brighter future, as it strives to achieve science college status. For the head and staff at the school, the impact of the changes is more than merely economic and practical. Needing to provide a beacon of excellence and hope in an area not without its share of problems, the school is sandwiched between three social housing estates where, like in so many others, petty vandalism and drug related crime, whilst not endemic, is rife. 35% of the pupils at the school are eligible for free school meals – that’s twice the national average. Although it is a Roman Catholic school, its intake is totally non-selective. Within that context, the school maintains an excellent ethos, reflected in its recent OFSTED report, which praises the school for the contribution it makes to enriching the life of its pupils. The team strives to instil pride in the pupils who come here, and ensure they have a confidence in their own value and potential. But if the school is to do that, it also needs to provide a visible manifestation that education matters, and in that sense, how the buildings look matters immensely. The need for major repair work, especially on the oldest sections of the school, had become pressing. The target of five-year repainting programmes had not always been met, due to budgetary constraints. Even where it had, the fabric of the buildings had deteriorated significantly. Whilst, in many places the actual steel frame of the curtain walling system remained structurally sound, on some of the full-height stairwells the units were deflecting by as much as twelve inches, with all the inherent safety risks that that posed. The aluminium horizontally sliding windows installed in many of the classrooms in earlier refurbishment phases had become inoperable and, in some instances, the casements had actually blown out during storms. The need was for a thermally efficient, aesthetically pleasing low maintenance, long-term solution. Earlier attempts to install replacement PVC units within the structure had not been particularly successful. And when surveyors Wm Harvey undertook further investigation of the original school block, they discovered that, over the years, the area behind the now rotting facia boards of the curtain walling had been back-filled with cheap building materials. More alarmingly, many of the metal sheet panels had been thermally insulated using asbestos, which now posed a potential health risk to pupils and staff alike. The solution was to take all eight science labs out of commission once exams were over in the summer term, and screen off the areas whilst specialist contractors stripped out all the asbestos. Following extensive wind-load testing of its Sheerframe curtain walling system, L.B. Plastics provided a replacement solution which involved retaining the original steel frame structure of the CLASP system, onto which was attached, via specially designed brackets, an aluminium frame system. Into this, pre-manufactured glazed and infill PVC frames were affixed, to create a thermally efficient, structurally sound curtain-walling facade which would require only minimal future maintenance. H Jarvis Ltd made the frames which were installed by Tyneside company McGann Builders, working with main contractor McCarrick Construction Co Ltd. Teams of three and four fitters, working under supervision, completed the installation of two vertical sections of the two storey structure each week, starting at the rear elevation, and paying particular attention to site management and health and safety issues, given that the work commenced in term time and the safety of the children on site was paramount. 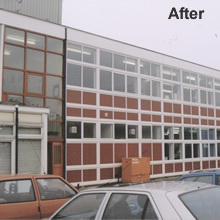 To improve sightlines and to ensure the optimum thermal performance and longevity of the windows, Sheerframe co-extruded profiles were use, with both fixed light and top-hung casements, as well as insulated infill panels at ground floor level on each storey, colour-matched to the school’s corporate colours. Opening windows were fitted with locking handles and, as an extra safety precaution, safety opening restrictors. On the interiors, the original steel structure was neatly boxed in and plastered. 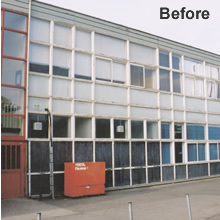 Notwithstanding that the asbestos removal had delayed the start of work on the frame replacement programme, by the start of the autumn term two of the science labs had been re-commissioned and the other six followed shortly, resulting in virtually no disruption to the education of the pupils at the school. The £250,000 project, part-funded by the Roman Catholic dioscese via its capital project programme, has made a significant impact on the school. You only have to look at the entrance façade to be impressed by the difference it has made to the appearance of the school. The new ambience within the entrance area and science labs especially has had a tremendous impact on the morale of those who work within it – and there is a very important lesson in that fact. There is clearly much more work to be done around the campus, but the Edmund Campion team now knows that, in the Sheerframe system, there is a very workable and cost-effective solution. The lesson is one which will be heeded by the literally hundreds of schools across the UK who face the same problems of deteriorating curtain walling structures.